Ms. Knaus from Ipsos Reid Public Affairs is to provide a presentation regarding the results of the 2012 Citizen Satisfaction Survey. Council recently approved a change which requires all delegations speaking to an interest not on the agenda be heard at the COW meeting instead of a regular council meeting. 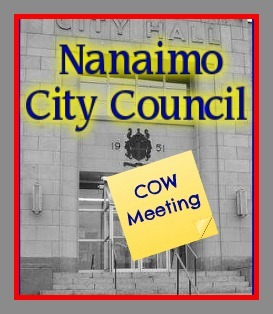 This means that if it is not telecast there is little chance Nanaimo residents will ever hear the matter as COW meetings are held at 4:30 in the afternoon, meaning fewer people will be able to attend, also the press coverage of these meetings is spotty at best. While all councilors say they are in favour of transparency, it is only by their actions you can decide if they mean what they say, or are just spouting good sounding election promises, which mean nothing after elected. An election promise I don't remember hearing was : " vote for me and I promise to spend another $700,000 in the next five years on a spin doctor". The year before I don't remember any councillors telling me that they would be increasing my taxes for the next 4 - 5 years in order to pay for a shiny new office for staff, which they built without going to public tender.